The Jaccard VA4000 food slicer is fully automatic, programmable, fast, clean and efficient. The VA4000 food slicer is fully automatic, programmable, fast, clean and efficient. Ideal for large kitchens, delicatessens and processed meat works. This machine slices, collects, stacks or shingles products, all in one operation. 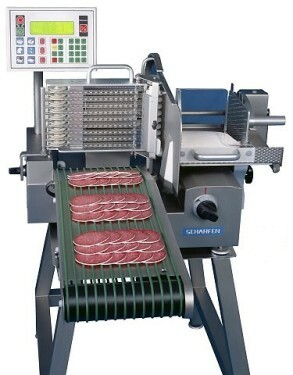 Depending on the product width, two or more pieces may be loaded on the meat table for one slice operation, increasing productivity. All components coming in contact with the product being sliced are manufactured in stainless steel, the ultimate in food safety. SHOWN WITH CONVEYER. Combined end piece holder and meat comb to reduce waste. Programmable slicing, stacking and shingling operations. High performance fan-cooled motor for increased efficiency. Separate push button ON/OFF and START switches for safety. A range of optional components, including conveyors are available.